A winds-of-change drama set at Wellesley College in 1953, Mona Lisa Smile tackles women's issues as attitudes transition from a post-War focus on domesticity to the initial rumbles of feminism. Moving from California, Katherine Watson (Julia Roberts) joins the faculty of the prestigious all-women Wellesley College near Boston as an Art History teacher. In her early thirties, Katherine is already considered dangerously close to being past the age of marriage. Katherine becomes friends with her landlord Nancy (Marcia Gay Harden), who has grown too old too soon after losing her husband, and roommate Amanda (Juliet Stevenson), the independent minded College nurse. And while she finds her students phenomenally smart and well-educated, the entire focus of their lives is on finding a husband before finishing college. The students include Joan (Julia Stiles), who has potential to study law at Yale should she choose to look past a future as a housewife; Betty (Kirsten Dunst), the most privileged of a privileged bunch and already planning her wedding; Giselle (Maggie Gyllenhaal), a free spirit seeking plenty of sexual adventure and harbouring a deep crush on Professor of Italian Studies Bill Dunbar (Dominic West); and the plain Connie (Ginnifer Goodwin), who is considered least likely to snag a husband. Katherine tries to instill in her students a greater sense of ambition, urging them to look into futures that could offer something different than husbands, kids and housework. She faces a significant backlash from both the students, who have been raised with predefined expectations, and the College administrators, who do not take kindly to Katherine challenging time-honoured traditions. Katherine also has to sort out her personal life, with Bill taking an interest in her, and her California boyfriend Paul (John Slattery) seeking a commitment. Directed by Mike Newell, Mona Lisa Smile delves into the status of women as they see themselves. With plenty of intelligent characters at interesting crossroads in life, the film never lacks for variety, opposing viewpoints and conflict. The script (by Lawrence Konner and Mark Rosenthal) manages to create an academic environment where minds are free to explore big questions about the future, the value of education, and the ambitions of women relative to society's expectations. There is no shortage of perspectives, and the film does a fine job of challenging both old and new attitudes. Katherine Watson is a catalyst for change, holding on to her principles and not afraid to shake the established structure. Some branches will fall on her head and she will learn as much as she will teach. 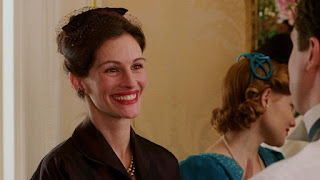 Mona Lisa Smile gets the pacing of history right, and Katherine discovers that grand societal changes do not come easily or quickly and for every two steps forward there is at least one step back. The film also has a couple of neat tricks up its sleeve, with a couple of curves in the road ahead for the students over the course of their one year interaction with Katherine. Betty and Joan in particular will find their trajectories disrupted by Katherine, and not in the way that they could have expected. With her mother represent the prevailing feminine power elite, Betty will have the most heated clashes with Katherine, encounters that will change them both. Joan holds the most promise as being open and able to disrupt the status quo, but Katherine will learn the most about the pace of change from Joan's journey. The film engages because Katherine and her students are women worth knowing in any era, and it is refreshing for a film to feature a cast of uniformly smart women, elevating their discourse and sparring to a refreshingly educated level. They still poke and needle each other and push each other's buttons, but within a context of striving to achieve either the aspirations of the past or the promise of the future. Filmed on the Wellesley College campus, Mona Lisa Smile tries hard to recapture the 1950s at a New England campus for the elite. But there is a lingering sense of slightly modernized setting and attitudes. Julia Roberts contributes to this by not trying too hard to change a pre-established persona that is strongly linked with a more recent era. Kirsten Dunst, Julia Stiles, Maggie Gyllenhaal and Ginnifer Goodwin represent some of the best young acting talent assembled into one film, but they also go only so far in being convincing as 1950s daughters of what would become the Greatest Generation. The tension between a woman's outward smile and her internal dissatisfaction gives the film it's name. Mona Lisa Smile does not necessarily provide all the answers, but does perceptively ask some of the questions at the heart of modern social evolution. ...and that's maybe why Mona Lisa Smile does not get as much respect as it deserves. it's just as good as that film, and still it gets overlooked. it's unfair.